Over the next few months we are going to follow how Mumbai’s transportation infrastructure weathers monsoon season. While the monsoon rains are crucial for largely agricultural India, they are a blight on India’s urban transportation infrastructure. Highways disappear under flood waters, decrepit bridges and drains collapse, and transit projects are delayed or seriously set back. 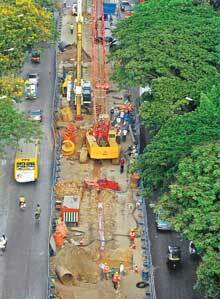 In late March, Brihanmumbai Municipal Corporation (BMC) Commissioner Swadhin Kshatriya told reporters that pre-monsoon infrastructure – including road work, Metro, Monorail, and skywalk construction – would be completed or left at a monsoon-safe stage by May 10. But as heavy rains fell on Wednesday (the true heavier monsoon is expected to arrive around June 11), Mumbai’s transportation system didn’t seem prepared. The BMC has identified 248 areas in danger of waterlogging, and BMC officials admitted that ongoing infrastructure projects, including the Metro and the Monorail (Mumbai Metropolitan Region Development Authority projects) would increase flooding in certain areas. In addition, debris from BMC Roads and Bridges Department projects still blocks the Pratiksha Nagar nullah, a vital drain in a low-lying, flood-prone area. As the BMC and the state’s Maharashtra Housing and Area Development Authority (MHADA) argue over who is responsible for cleaning the nullah, residents say it has been months since the nullah has been cleared. The clogged, polluted nullah increases residents’ risk of contracting malaria and hepatitis, and one resident lost his job because of a skin ailment that he blames on the polluted water. In a case like this, it’s clear that transportation has a direct link to public health. 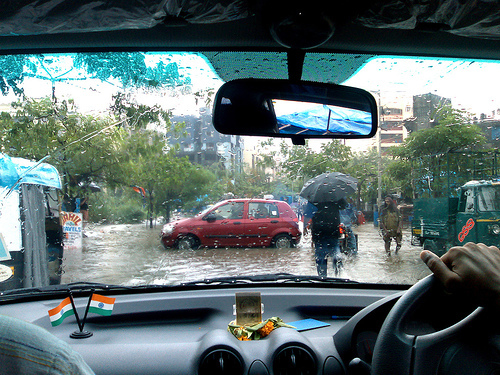 Throughout monsoon season, as problems become evident, TheCityFix will highlight potential solutions. An evident problem is confusion about roles and responsibilities among myriad government agencies. Better organization among city and state planning agencies – eliminating arguments over jurisdiction, responsibilities, and “passing the buck” – could make a huge difference in the future for monsoon preparedness. Please let us know what you think about Mumbai’s preparedness for the monsoon. Post your comments, send your pictures, or write a blog entry.